Lextran, located in Lexington, Ky. The once-bustling G.E. incandescent lightbulb factory at 200 West Loudon Ave. in Lexington had shut down in 2010 becoming an eyesore, and a financial drain on the city. With no suitable tenant, the building was demolished and the 14-acre site was closed off due to ground contamination. It had become what is known as a brownfield, a property that is abandoned or underutilized due to real environmental contamination or the perception of environmental contamination. The property sat vacant until June, 2013, when Lextran, the city’s bus system, with risk-management assistance through the Kentucky Department for Environmental Protection’s (DEP) Brownfield Redevelopment and Reuse program, agreed to buy the former G.E. site for $1.7 million. Over the next three years, what was once a contaminated piece of Lexington’s downtown acreage was transformed. 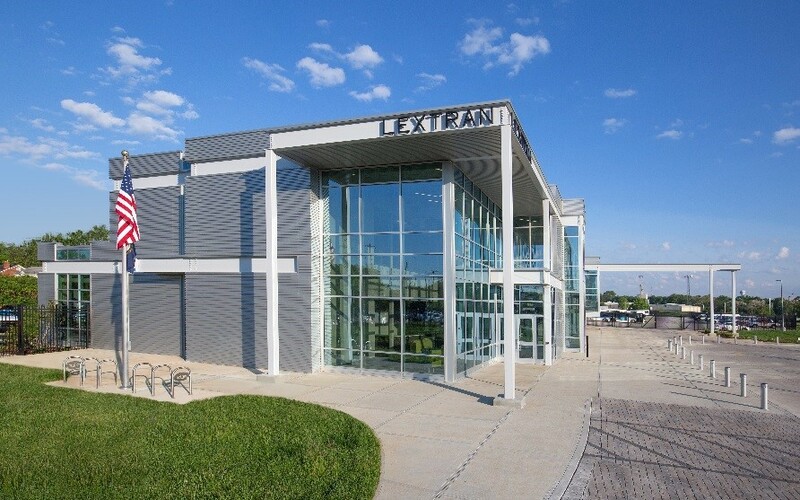 Ensconced in a new building, Lextran, with a $20-million budget, now provides jobs, taxes and puts the bus system closer to its Lexington riders. Located in Lexington, Lextran, was once a contaminated site. The Loudon Avenue facility, is part of a success story similar to many other brownfield projects being done across the state that help communities take eyesores and turn them into productive use. “It was a win in that Lextran finds its main operating facilities closer to its clients,” said Tony Hatton, Deputy Commissioner of the Department for Environmental Protection. “We no longer have a piece of property sitting there fallow that those who live around it have to look at, and that property has been returned to the tax roles where it can generate economic benefit. There are an estimated 8,000 brownfields across the state. They include sites such as old gas stations, abandoned schools and hospitals and former dry cleaning facilities. In many cases, economic change has left behind properties that not only cause blight, but may pose environmental and safety issues for a community. They also can invite crime, decrease property values and promote disinvestment in areas. The brownfield program is having the opposite effect, working successfully since 1997 to create opportunities for businesses and non-profits, cleaning up perceived and real environmental contamination and returning environmentally questionable or unused pieces of property back to the tax rolls and back to the community. And because these sites most often have water and sewer infrastructure already in place, or access to railroads and interstates, they are they can be more attractive sites for redevelopment than “greenfield” sites, which are undeveloped areas, according to Hatton. “It may have buildings on it as well, you’re not going to endure the capital startup costs if you buy a greenfield site that hasn’t been developed,” Hatton said. Some brownfields sites need immediate cleanup before the site can be reused. Some of these cleanups can be done with a relatively small price tag, others require a large amount of funding – especially when the responsible party is unknown or unable to pay for the cleanup. In 2016, dangerous levels of arsenic were discovered in the soil of a defunct wood treatment plant on Long Lane in Montgomery County on which more than a dozen residences had been located. So the Kentucky Division of Waste Management (DWM) last year alerted residents and temporarily relocated the neighborhood, before doing the cleanup. A contractor hired by DWM dug up soil to a depth of two feet, and replaced 43,000 yards of contaminated soil with clean dirt. The total cost? $4.9 million. The state does this for two reasons. First, it protects and environment and health of Kentuckians. Second, because the payback is so large when brownfields are recovered and reused. Conservative estimates show that for every dollar spent on a brownfields site, the development generates an eight-fold return for the community. West Sixth Brewing in Lexington is an example of a brownfields success story that was also an economic benefit to the community. What used to be the Rainbow Bread Factory in downtown Lexington was passed over for redevelopment multiple times due to the perception of lead and asbestos concerns. In actuality, a property analysis showed that little remediation was needed. This 90,000 square foot structure, affectionately referred to as “The Bread Box” is now home to not only the brewing company but also six other businesses and nonprofit organizations. “The neighbors are happy because the street corner has gone from being blighted to becoming a vibrant, positive influence,” says Ben Self, one of the partners in the re-development and one of the four owners of West Sixth Brewing. West Sixth Brewing outside view today. Since 2005, the brownfield redevelopment program has helped communities attain $12.7 million in assessment and cleanup funding. In addition to its work with the private business, the program also offers support services to the public sector. “One thing we can do for non-profits, local governments and quasi-governmental agencies is our assessment program,” said Amanda Lefevre, Assistant Director in the Division of Compliance Assistance, for the KDEP. “If one of these folks comes to us and wants to redevelop a property, we can do an assessment for them, free of charge. That would include a phase one environmental assessment, a phase two assessment, along with an analysis of brownfield cleanup alternatives. “From that point, if they’re an eligible entity, we can help them prepare for a brownfield grant to help them with remediation costs,” she said. The program also can help communities tap into other resources such as federal assessment and area-wide planning grants and sub-grants and loans from its Cleaner Commonwealth Fund that is also part of the Kentucky Brownfield Redevelopment Program. Program staff can help identify what service is needed and available to make a project work, according to Lefevre. Owensboro, for instance, was able to take advantage of those assessment services to help revitalize the city’s aging and underutilized riverfront. “The brownfield re-development on Owensboro’s riverfront allowed them to take down some older structures like an old Executive Inn, an old state office building and turn it into an area with a brand new convention center, hotels to support that and a recreation area,” Lefevre said. Part of the reason that the brownfield redevelopment program has been so successful is that legislation adopted in 2012 established the Redevelopment and Reuse Program that allows those undertaking brownfield redevelopment to manage their risk because the environmental liability of the property doesn’t transfer to the new owner. The city of Louisville is seeing the development of a soccer stadium from 19 commercial and industrial properties that contain brownfield sites that was made possible by the Brownfields Redevelopment Program. Through the project, numerous properties under different superfund management plans and idle environmental covenants and deed restrictions were put them under one master property management plan. The result? The Cabinet is helping enable an investor-led $200 million development that includes a soccer stadium along with office, retail and hotel space that a study says could eventually generate $13 million a year for the community in new tax revenue. Since 2012, more than 179 properties have gone through the redevelopment process and the economic impact has been positive. “According the United States Environmental Protection Agency, for every dollar you invest in a brownfield property, you’re going to realize $16 in profit,” Hatton said.